Kuwait airport relit with Luceco systems ... energy savings of 68 per cent. Luceco says its lighting systems, installed at numerous projects in the Middle East, have been truly cost-effective, offering savings of more than 60 per cent. High-efficiency and long-life LED lighting provides the perfect solution to today’s market demands for environment-friendly, energy-efficient and low-maintenance lighting, says Luceco, a global lighting manufacturer. The company has been fitting buildings in the region with these solutions which, in some instances, have offered savings of more than 60 per cent in running costs. 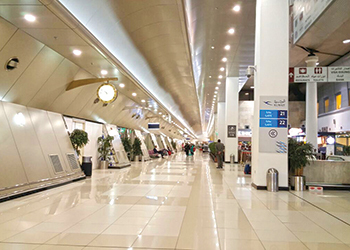 Luceco recently relit the departure and arrival gates, immigration counters and public areas at the Kuwait International Airport, where it met the design brief which included energy-efficient lighting with low maintenance that would provide cost savings whilst enhancing the passenger experience through more effective lighting. Supplied through Musaed Salem Al Abduljader Company, Luceco delivered the LED lighting solution which called for the replacement of 2X26 W compact fluorescent lamp (CFL) downlights with more than 6,000 18 W carbon luminaires. “Carbon downlights are an ideal replacement for compact fluorescent downlights, offering running cost savings of more than 60 per cent,” says Luceco Middle East general manager Venkat Raman. “With the project completed, CO2 (carbon dioxide) omissions have been reduced by over nine tonnes annually and energy savings of 68 per cent have been calculated with additional savings gained from not having to replace failed fluorescent lamps, providing a truly no-maintenance, cost-effective LED lighting solution for Kuwait International Airport,” Raman adds. Raman and his team are based in Dubai, UAE, and have worked on many blue-chip projects in the region offering lighting design as well as sales support, warehousing and distribution services. Spinneys in Khalidiya... first UAE store to be refurbished with LED luminaires. 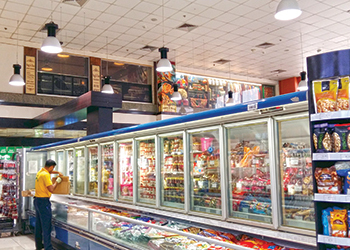 Luceco Middle East has also provided LED lighting solutions to the retail sector including the Spinneys Supermarket chain where it worked with the facility management team at Al Seer Group to replace conventional metal halide fittings with energy-efficient LED luminaires. According to Raman, the Titan High Bay was evaluated and chosen for its energy efficiency, cost effectiveness and appearance when installed. “Spinneys in Khalidiya, Abu Dhabi (UAE), was the first store to be refurbished, resulting in 50 per cent reduction in energy consumption. With instant light output and restrike unlike traditional HID (high-intensity discharge) fittings, the High Bay provides over 50,000 hours of maintenance-free operation,” he says. Luceco has recently supplied Central Mall in Khalifa City, the first shopping mall in Abu Dhabi to be fully equipped with LED lighting technology. The company provided a full LED lighting solution package for the project, offering significant operational benefits including reduced carbon emissions and operational costs, improved energy efficiency and no maintenance requirements. Other specification markets include healthcare applications where Luceco has worked with the World Health Organisation (WHO) and American Spine Centre. Education application sector projects include the Hashemite University in Jordan. During a recent lighting refurbishment, Luceco supplied 3,500 LED LuxPanel luminaires. The company was chosen for the overall energy efficiency of the luminaire boasting more than 50,000 working hours with no maintenance as well as being quick and easy to install. 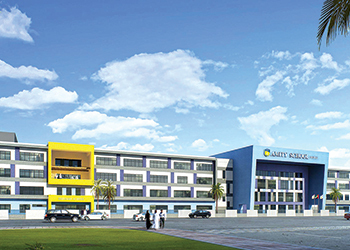 Luceco was also selected by Amity Group for an energy-efficient lighting solution for its new school buildings in Al Qusais, Dubai, where it delivered a complete package for both the interior and exterior applications. LuxPanel and Platinum downlights were installed in classrooms and assembly rooms and IP65 rated LuxPanels were used in laboratories. Transit areas, corridors, rest rooms and the library were also lit using downlighter luminaires from the Platinum range. Titan High Bays were installed in indoor sports facilities. Externally, recreation areas, the swimming pool and sports courts were lit with commercial floodlights and Atlas bulkheads, bollard fittings and buried uplighters provided the amenity lighting around the buildings. Amity School, Dubai ... reaping the benefits of LED luminaires. Amity School now benefits from the huge advantages of LED energy-efficient luminaries compared to traditional light sourced fittings, providing cost-effective, durable and safe lighting to meet the demands of any educational environment, Raman says. Luceco has also stepped into the domain of hazardous lighting in the region with its latest tie-up with Raytec. The company has agreed to collaborate with hazardous area lighting manufacturer Raytec to market the latter’s product in the Middle East and North Africa. Raytec’s high-quality LED hazardous lighting range complements the commercial and industrial portfolio from Luceco. This strong alliance combined with innovative LED solutions for hazardous areas will play a significant role in the growth of both Raytec and Luceco in the region. Raytec is a driving force in the advancement of LED technology for hazardous area applications and Luceco is committed to innovation for industrial luminaires with environment-friendly and energy-saving products such as Ceres, Titan, Luxbay, Indus and Luxpack, he says. Headquartered in the UK, Luceco is a rapidly growing manufacturer and distributor of high quality and innovative LED lighting products and wiring accessories. The group supplies a blue-chip and diversified customer base with a wide range of products which broadly fall into the market-recognised brands of Luceco (LED lighting), British General (wiring accessories), Masterplug (portable power) and Ross (audio-video accessories). Luceco runs a fully integrated operating model which includes wholly-owned manufacturing and product development facilities. The Luceco brands currently equate to a global sales in excess of £125 million ($161 million). Luceco’s head office is in London with global offices in Telford (UK), China, Houston (US), Hamburg (Denmark), Paris (France), Barcelona (Spain), Dubai, Hong Kong and Johannesburg (South Africa), offering sales and support to European, Mediterranean, Middle East, Africa and Asia-Pacific regions.